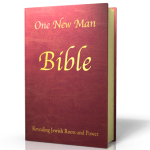 Why The One New Man Bible? The One New Man Bible brings a greater understanding of and appreciation for the power given to believers for their daily walk. Hebrew is a very expressive language; this translation brings out much of the power that has commonly been omitted from traditional English translations. 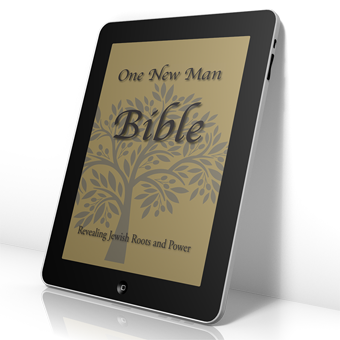 Click here for a sample of the One New Man Bible. This edition of the One New Man Bible is beautifully finished with gold embossing on maroon synthetic leather cover, gilded page edges and maroon satin placeholder ribbon. These Bibles have Smyth-sewn bindings for a lifetime of use! This exhaustive commentary includes 242 pages filled with more than two-hundred indexed subjects. 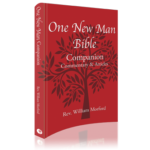 This companion to the One New Man Bible, will serve as a useful and constant guide in your Bible study for years to come. 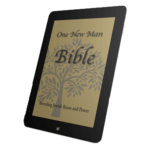 The One New Man Bible is available on the Kindle store, in Apple iBooks and in PDF format! Perfect for your Kindle reader, iPad, Nook and all other tablet and smart phone readers. The PDF version is perfect for reading on your computer! Why the name ‘One New Man’? For He is our peace, the One Who has made both things into one and Who has loosed the dividing wall of the fence, cause of the enmity to His flesh, 15. by His nullifying the tradition of the commandments by decrees, so that He could create the two, Jewish and non-Jewish, into One New Man, establishing peace 16. so He could reconcile both in one body to God through the cross, as God killed their enmity by means of Y’shua. 17. And when He came He proclaimed the Good News of peace to you, to those far away, and peace to those near: 18. because through Him we both have the introduction to the Father by means of one Spirit. 19. Therefore then, you are no longer aliens and strangers, but you are fellow citizens of the saints and members of the household of God, 20. building upon the foundation of the apostles and prophets, Messiah Y’shua being His cornerstone, 21. in Whom the whole building being constructed is being fit together into a holy sanctuary in the Lord, 22. and in Whom you are built together into a habitation of God by the Spirit. This passage, a letter originally written to Gentiles and former heathens, tells us that all are to worship the Living God of Abraham, Isaac, and Jacob, The King of the Universe, the God Who became flesh and walked among us. Why should Believers read The One New Man Bible? 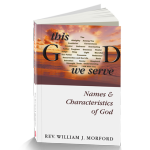 Readers will understand that the Scriptures Y’shua, and every New Testament author, embraced (irreverently called Old Testament by the Church) are alive and relevant for believers today. 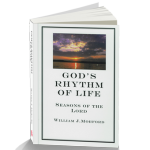 As a proof of God’s perfect plan for His perfect Word, readers will discover that Matthew flows, as if a continuous stream, out of the book of Chronicles. Only God could have done this! 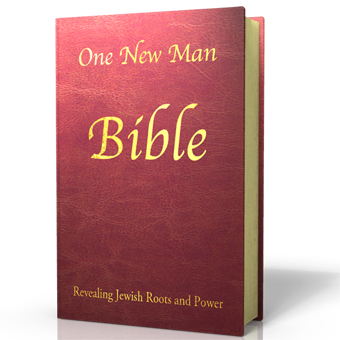 The One New Man Bible has been written to help present day believers move toward God’s perfect plan to create One New Man, bringing Jewish and non-Jewish together. 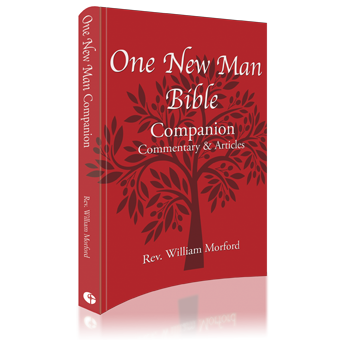 How is The One New Man Bible different from other translations? Scripture translated with the power and meaning of the original language intact comes alive! One early surprise is in Genesis 12:1 when God does not say “Go” to Abram, but “Get yourself out of here!” Later He tells Moses to order Pharaoh to “Send My people away!” instead of pleading “Let My people go.” These passages are the literal translation from the Hebrew. The One New Man Bible includes more than 4,000 footnotes and the massive one hundred seventy page Glossary describes various first century Jewish customs and explains Hebrew Scriptures, such as Leviticus 14, which on the surface is about cleansing a leper, but has a much deeper meaning. Many Jewish sources were studied to bring the Scriptures to life, including many modern as well as ancient Jewish commentaries. Those studies bring real depth to the subjects in the Glossary, but even more importantly they give insight into the thinking of the New Testament authors, the Apostles, and especially Y’shua. It is important for those of us reading in the twenty-first century to understand what a word or expression meant to those who wrote the passages in Bible times. The New Testament of the One New Man Bible was translated into English from the United Bible Society’s Fourth Edition Greek text, which employs Textual Criticism to determine which of the more than five thousand ancient Greek manuscripts of the New Testament were closest to what the authors wrote in the first century. Some words have been translated differently because the traditional translation conveys something not intended by the author. One of those words is the Greek word Ekklesia, which means a gathering of citizens called out from their homes into some public place. Implicit in Ekklesia is a summoning, so this is not just a collection of people, but people called out to a public meeting for a particular purpose. Ekklesia is commonly translated church, but because of our association of church with both a building and an organization, in this translation, Ekklesia is translated congregation. The Greek word Nomos has nearly always been translated Law, even when used for the Hebrew word Torah. Torah does not mean Law. It means Teaching. When you see Torah in this translation, do not think Law, but of the Loving God teaching His children, offering an outline to guide them for a better way of life. This translation has as its goal to be a very readable text that flows from one book to another while preserving much of the Jewish flavor, especially the Jewishness of Y’shua, and much of the power in the Hebrew and Greek expressions. Gn. 15:6.And he believed in the LORD*, and He counted it to him for acts of loving kindness. Gn 15:6 Abram believed the LORD, and he credited it to him as righteousness. Gn. 18:19. For I know him, that he will command his children and his household after him and they will keep the Way of the LORD*, to do acts of loving kindness and judgment, so the LORD* may bring upon Abraham that which He has spoken of him.” Gn 18:19 For I have chosen him, so that he will direct his children and his household after him to keep the way of the LORD by doing what is right and just, so that the LORD will bring about for Abraham what he has promised him. Gn. 24:12. And he said, “LORD* God of my master Abraham, Make something happen right in front of me today, and act gracefully with my master. Gn 24:12 Then he prayed, “LORD, God of my master Abraham, make me successful today, and show kindness to my master Abraham. Ex. 7:16. And you will say to him, ‘The LORD* God of the Hebrews has sent me to you saying, Send My people away! So they can serve Me in the wilderness. And behold, till now you would not listen. Ex 7:16 Then say to him, ‘The LORD, the God of the Hebrews, has sent me to say to you: Let my people go, so that they may worship me in the wilderness. But until now you have not listened. Amos 3:3. Can two walk together unless they meet?! Amos 3:3 Do two walk together unless they have agreed to do so? Ps. 19:15. The words of my mouth and the meditation of my heart will be acceptable in Your sight, LORD*, my Rock and my Redeemer. Ps. 19:14 May these words of my mouth and this meditation of my heart be pleasing in your sight, LORD, my Rock and my Redeemer. Ps. 150:6. Everyone who has breath will praise the LORD*! HalleluYah! Ps. 150:6 Let everything that has breath praise the LORD. Praise the LORD.